Home is a painful word for Paris to spell. She’s been sent from one mean foster family to another, never feeling welcome, never fitting in. Having her brother by her side made it tolerable, but now the system has ripped them apart. Nikki Grimes’ numerous books include Coretta Scott King Award winner Bronx Masquerade and Coretta Scott King Honor winner Jazmin’s Notebook. A textile and multimedia artist, Grimes currently lives in California. However, she once lived in Ossining, New York, with a wonderful foster family of her own. Have you ever stayed with another family for a couple days? What was that like? Can you imagine living with another family without knowing how long you might stay? What would be the most difficult part of being a foster child? How would you feel about your birth parents? Why do Paris and Malcolm decide to leave the Boone’s home? Where do they go? Why can’t the kid’s grandmother keep them with her? Describe the Lincoln’s home, both the physical and emotional space. What events help Paris feel like she belongs in Ossining? In the end, where will Paris live? Why? Compare Paris and Malcolm. How they are similar, how they are different? How do they depend on one another? Why do you think they are so close? Where does Malcolm end up during their separation? How are they reunited? Do you think they will always remain close? In the beginning Paris says, “Sometimes I wish I was like my name, somewhere far away, out of reach.” and also, “She felt like a nobody caught in the dark spaces in between. A nobody on her way to nowhere.” (p.19) Does she still feel this way by the end of the novel? How has she changed? What changed her? Why is Paris so frightened by the nighttime routine at the Lincoln house? How is it resolved? What does this show us about her foster mother and brothers? Why is the word home such a strange word for Paris? How does she think about it differently than most kids? What can turn a house or address into a home for a child? How do Aunt Jolene and Sheldon nearly ruin Thanksgiving for Paris? Do you think both of them had cruel intentions or was it simply ignorance? Does it matter? How would you have handled Jolene and Sheldon if you were Mrs. Lincoln or David. Who becomes Paris’s best friend at Claremont Elementary? What do the girls do together over the school year to seal their friendship? How is that friendship destroyed? Do you blame Ashley or her father the same or more? Why? Describe Paris’ conflicted feelings when she visits her mother in the city. How does her attitude change over the weekend? What does she learn about herself? Paris becomes involved in what church activity? How does this teach her to keep “God in your pocket?” Do you think this is the activity that most influences Paris’ change of attitude and confidence? Why? At first Paris thinks that she’ll never try to have another white friend. What advice does her foster mom teach her about judging people? Does she take a chance again? With whom? Why? 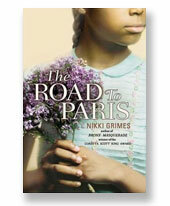 What decision must Paris struggle with at the end of the novel? How does she make up her mind? Would you make the same choice? Why or why not? Write a journal about how you have changed in the last year. What have you learned about people or yourself? What big events have changed you? What do you hope for in the future? Paris creates by hand both Christmas and Valentine's Day presents. Create your own special gift for a friend using only materials you have around your house. Explain what you made in a short journal. Paris learns that singing gives her great comfort when she is feeling decidedly blue. Make a list of things that you can do that lift your spirits when you too are feeling down. Find time for the things on your list. Children who are in foster care often move quite often but don’t have luggage. Donate old duffel or gym bags to your local foster agency. You might also consider having a fund raiser or drive for the bags (or luggage for older teens) and stuff them with school supplies, stationery sets, and envelopes so they can keep in touch with their siblings and other family members. Teacher's Guide provided by Tracie Vaughn Zimmer. Visit her website by clicking here.